Using a Kubota diesel for industrial applications makes sense. The engines are top notch. While created with excellent parts, these builds will last for a long time. There is a reason why some brands are more popular than others. It is not just a personal preference. 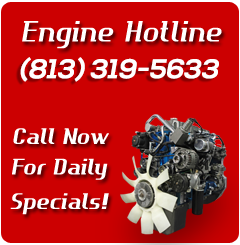 GotDieselEngines.com sells used Kubota engine inventory right here online. There are two-cylinder, four-cylinder and six-cylinder motors that have been manufactured in the past three decades. Not all of these are diesel though. Kubota is also known for making some gasoline variants. Not all machinery is configured to accept diesel technology. Getting your hands on tested and clean inventory is a big responsibility. We help with that. Farm equipment, forklifts and other machines rely on Kubota diesel engine blocks. These are spread out in all parts of the world. There are few companies that have a bigger diesel fleet. When it comes to inventory on this website, there are units that sell more than others. Dependability does matter. It means the difference between a dead start and one that always starts. Even if you buy used, you should be able to get a lot for your money. We keep this in mind when we find components and complete diesel engines to sell to consumers. It assures consumers when we say that we put out a warranty for our stock of motors. No one has to wonder if we will step up and help them. When a factory part fails, it is a little disappointing. It is not the end of the world though. The parts warranty that we provide usually takes care of any mishaps to stock parts. Every policy has the same verbiage. No one is left out of the loop. The used Kubota motors inventory that we have comes out of junk yard or through equipment buys. Companies that go out of business sometimes sell their back stock of machinery. This is divided up and sold on the second hand market. We are not called Got Diesel Engines for nothing. People come here and find parts. SKU numbers, block stamps and other numbers are used to match what we have. Anyone can get into our computer database and look around. The full pricing including any discounts is presented. No last-minute price changes happen once a sticker price is looked at. If you cannot find something you want here online, go ahead and call us. We pay for the call through our toll-free customer line. Let us spend a minute or two with you. It might make the difference in you saving money or spending a lot at another company.